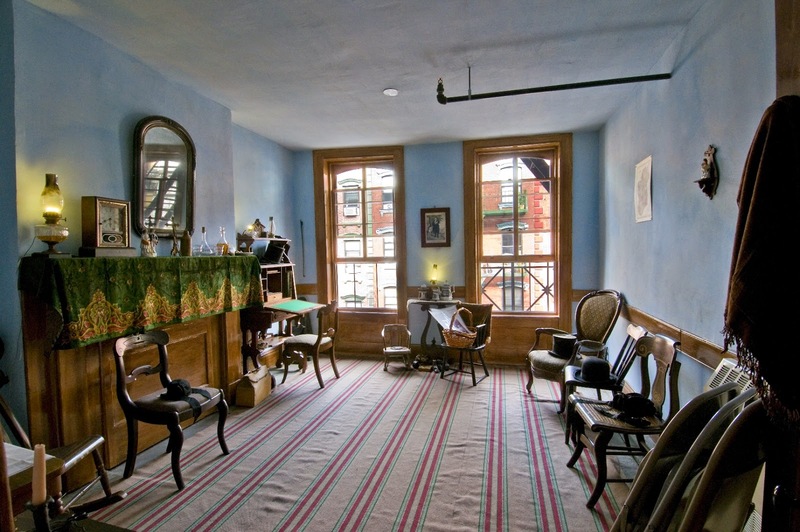 I've wanted to go to the Lower East Side Tenement Museum since Katie and I took a tour of the Lower East Side with Jeff from Walks of New York this spring. On that tour, I learned a lot about the history of immigration to the LES and realized that I currently live in an old tenement building. When my parents visited last weekend, I thought it would be a great opportunity to finally tour this museum, especially because they hadn't been to the LES on any of their previous visits. 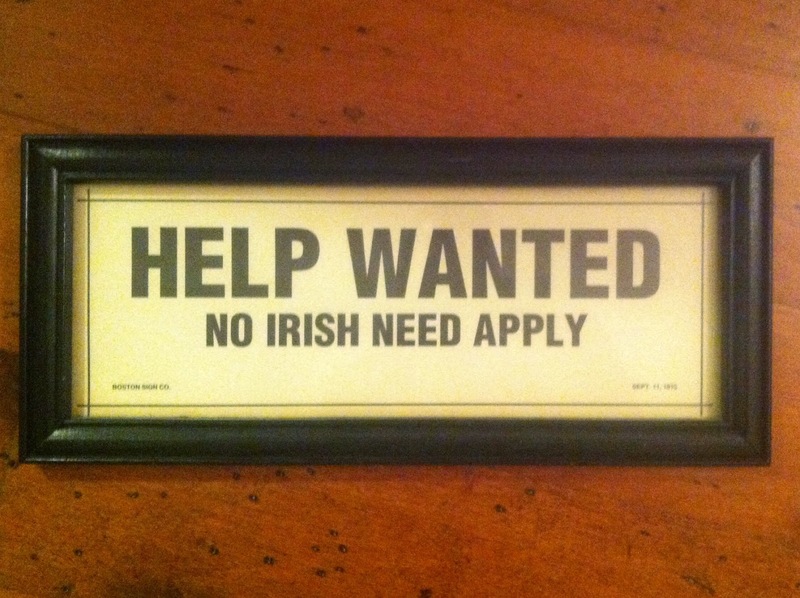 There are a variety of options to tour the Tenement Museum (including food tours and visits with actors dressed as the occupants of the tenement from the 19th century), but the one that stood out most to me was the "Irish Outsiders" tour, because my dad and I are obsessed with being Irish and my mom is a good sport. We timed our visit perfectly to arrive at the top-notch gift shop a half-hour before the tour started. Unbeknownst to us, there is an informative half-hour movie playing on repeat on the side of the gift shop. The movie is a great introduction to the history of the Lower East Side and has specific details about the tenement building we were going to tour, 97 Orchard. 7,000 people lived in this tenement from 1863 to the 1930s, when the top floors were boarded up because the owner of the building couldn't keep up with safety regulations - specifically replacing the wood in the common area staircase with fireproof material. Our "Irish Outsiders" tour started outside the gift shop with a brief introduction and a quick walk to the tenement building outdoor common yard, where the water pump (which only worked well in the morning) and the four toilet stalls were located. Our tour guide informed us that these toilets were only "flushed" weekly and were shared by the entire building. Already we were understanding that these living conditions were not ideal. 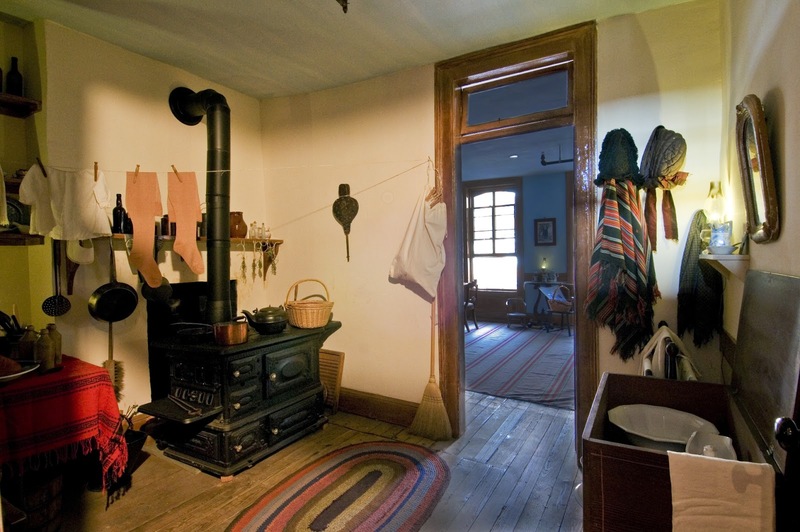 In the parlor, the Moore's apartment is set up how it would have been during the wake of their infant daughter who died of malnutrition while they lived in the apartment. It was complete with a baby-sized coffin, chairs where the women would sit closest to the body, and a shroud over the mirror because in Irish legend at that time, if you saw yourself in the mirror during a wake, you would be the next to pass on. It was sad to think of how much this family struggled to survive and how hard they worked for so little in return. It makes you want to thank your ancestors somehow for coming to this country with nothing so that you could complain about forgetting to DVR your favorite television show and it not being available yet on a machine you hold in your hands and on which you're able to contact Hong Kong in just 3 seconds. The apartment I live in now is where I've lived the longest over the last ten years and is also the first New York City apartment of my own. It will always remain special to me. Now that I know a little more about the types of people who may have come before me and what they went through, it means even more. I can barely fit all of my clothes in my closets but at one point there may have been 13 people from multiple families living within my walls. It makes me feel thankful to have my own space, but even more thankful to have a bathroom that I don't have to share with 20 other apartments and that I can flush more than once a week.